13 June 2016- Bahrain security forces arrested leading human rights defender Nabeel Rajab, President of the Bahrain Center for Human Rights (BCHR), Founding Director of the Gulf Centre for Human Rights (GCHR) and Deputy Secretary General of FIDH, early this morning. The arrest comes on the first day of the United Nations Human Rights Council (UNHRC)'s 32nd Session. We, the undersigned NGOs, condemn the arrest of Nabeel Rajab and stress that all human rights defenders must have the freedom to operate in their country. At approximately 5:00 AM (GMT+3) in Bahrain, police, led by the Cybercrime Unit, surrounded Rajab's home in Bani Jamra, in the north west of Bahrain. At 6:12 AM, Rajab's son Adam tweeted: "Police entered the house and arrested my father Nabeel Rajab." The authorities' reason of arrest is not yet known, and it is unknown if new charges have been brought against him. In 2015, police brought two charges against Rajab, together carrying up to thirteen years prison term, both in relation to statements he made on twitter. Rajab was not prosecuted on these charges, nor were they dropped. It is possible that he has been arrested on these old charges. The arrest comes on the first day of the UNHRC's 32nd Session. In his opening comments, Zeid Ra'ad Al Hussein, the UN High Commissioner on Human Rights criticised recent rights violations in Bahrain and warned: "Repression will not eliminate people’s grievances; it will increase them." Last week, under extensive pressure from the government, human rights defender Zainab Al-Khawaja, left Bahrain to begin her effective exile in Denmark. She left Bahrain after the Danish consulate in Bahrain communicated to her threats from a government official that she would be re-arrested and detained indefinitely if she remained. Zainab Al-Khawaja is the daughter of Abdulhadi Al-Khawaja, co-founder of BCHR and the GCHR and a torture survivor who has been serving a life sentence since 2011, when he was tried by a military court on alleged "attempted overthrow of the regime." Zainab Al-Khawaja, who began serving a 37-month prison term in March 2016, was released from prison on "humanitarian grounds" on 31 May, a day after political opposition leader Ali Salman had his sentence increased to 9 years in prison. The arrest of Nabeel Rajab and exiling of Zainab Al-Khawaja marks an effective silencing of Bahrain's human rights defenders. Yesterday, in a clear act of reprisal, Bahrain prevented six human rights activists, from boarding their flights to Geneva to participate in the 32nd session of the UNHRC. These activists were informed at the airport that a travel ban was now imposed on them. We condemn in the strongest terms the government of Bahrain's silencing of civil society and restrictions on their freedom of expression, association, assembly and movement, which sends signals that human rights violations will continue systematically. Rajab has been prosecuted multiple times since the 2011 Arab Spring. Rajab was arrested repeatedly in 2012, and served two years in prison between 2012 and 2014 on charges of organising unauthorised protests. Following his release in 2014, Rajab conducted an advocacy tour of Europe. In September of that year he visited the UNHRC in Geneva, the European Parliament in Brussels, and European capitals. 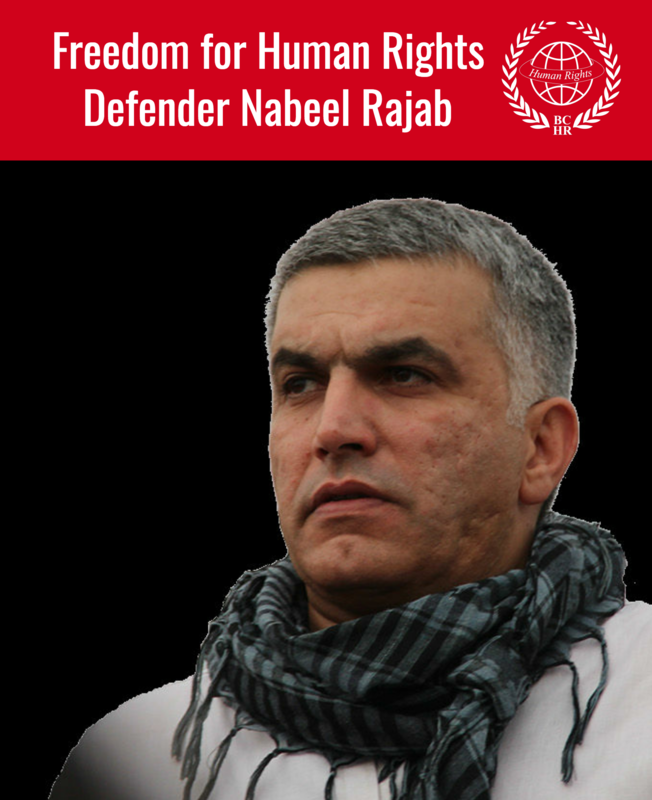 On his return to Bahrain in October 2014 following his participation in the 27th Session of the UNHRC, police arrested Rajab and charged him with insulting the army in a tweet. He received a six-month sentence and a travel ban. He was released on bail during the appeal of the sentence. In April 2015, police detained Rajab and charged him with insulting the Central Jau Prison administration and undermining the war in Yemen, after he spoke out against widespread torture occurring in prison and criticised the humanitarian costs of the war. Rajab was held in police custody until June 2015, when he received a royal pardon during Ramadan for his six-month sentence. However, his travel ban remained in place, and his charges were not dropped. The threat of prosecution on these charges has significantly hampered Rajab's ability to work. The first charge of allegedly “insulting a statutory body” comes under article 216 of Bahrain’s Penal Code, based on his social media comments about allegations of severe and systematic ill-treatment and torture of detainees in Jau Prison in March 2015. The second charge accuses him of “disseminating false rumours in times of war,” under article 133 of the Penal Code, based on social media posts criticising Saudi-led coalition air strikes in Yemen. Violations of articles 133 and 216 carry maximum sentences of 10 and three years in prison, respectively. Neither of the alleged acts upon which these charges are based were in any way recognisable criminal offences under international human rights law, and both involved the peaceful exercise of internationally protected rights to freedom of expression and to promote and protect human rights. Rajab's repeated arrests contravene his rights to freedom of expression and association, as protected by articles 19 and 22 of the International Protocol on Civil and Political Rights, which Bahrain acceded to in 2006. Immediately release Nabeel Rajab from police custody, drop all outstanding charges and lift his travel ban. Allow all human rights defenders, including Zainab Al-Khawaja, Nabeel Rajab and Abdulhadi Al-Khawaja, to live and work in their country without unjust restrictions on their rights to free assembly, association, expression and movement. Release all prisoners of conscience and political prisoners. Invite, and allow entrance to Bahrain, the UN Special Rapporteur on freedom of opinion and expression. Repeal all legal restrictions on civil society. Condemn Bahrain’s violation of the freedom of movement of its civil society, who were prevented from travelling to the UN Human Rights Council Session in Geneva this week. Cease all ongoing technical cooperation programs with Bahrain until such time as proper protection for civil society participants can be effectively guaranteed. 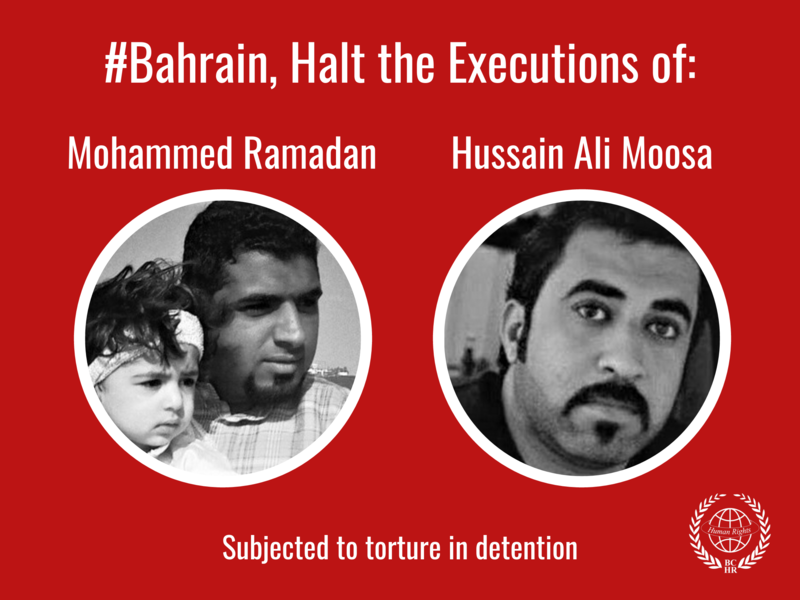 Raise concerns of Bahrain’s violations of the rights of civil society in your individual Item 4 statements. Continue technical cooperation with the government of Bahrain only when substantive conditions are met. Immediately call for the unconditional release of Nabeel Rajab and an end to restrictions on civil society. Suspend technical assistance programs until legal restrictions on civil society are repealed. Suspend all arms sales to Bahrain.